AFSCME Executive Director Jody Barr was issued a temporary restraining order by a Connecticut Superior Court judge in 2010, after his ex-wife told the court he harassed her at her job, harassed her co-workers, and was previously arrested for domestic violence, according to court documents. Barr was ordered to surrender or transfer all firearms, not to “assault, threaten, abuse, harass, follow, interfere with, or stalk the protected person,” and to stay away from his ex-wife’s residence. The initial October 21, 2010 restraining order was extended through June of 2011. AFSCME Council 4 represents nearly 30,000 state and municipal employees and is tasked with representing those employees in workplace grievance hearings, which are sometimes related to harassment claims – sexual and otherwise — during an era of heightened public awareness of these issues. It is unknown if union officials knew of Barr’s past, but, according to sources, rumors of Barr’s arrest began circulating among members when he ran for the executive director position in spring of 2018. 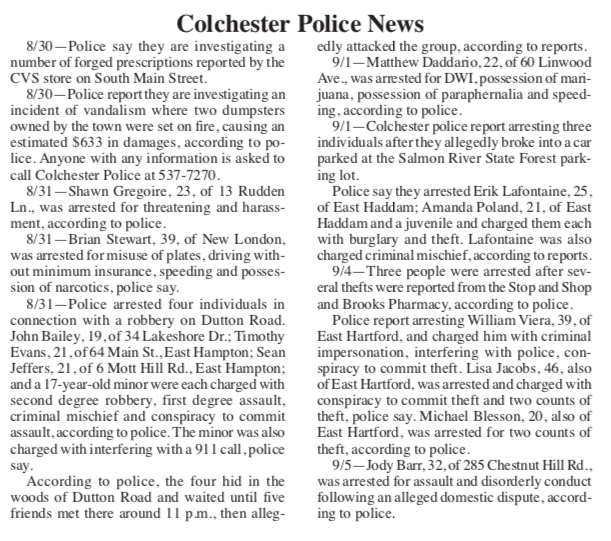 Barr’s arrest was documented in the Rivereast News Bulletin on September 21, 2007 as part of the Colchester Police Report. The incident took place at the home the couple shared at 285 Chestnut Hill Road. According to the news report, Jody Barr – then age 32 – was arrested “for assault and disorderly conduct following an alleged domestic dispute.” The couple did not officially file for divorce until 2008 and the matter was not settled until 2010, according to court records. Certain offenders are allowed to complete a family violence education program and have their charges dismissed, according to the CT Judicial Branch’s website. According to the court affidavit, Barr continued to contact his ex-wife over the course of the divorce proceedings, forcing her to change her work and cell phone numbers, and necessitating the restraining order. “He has been permanently ejected from my employer Foxwoods after coming and stealing my car while I was working and taking my employer phone from my hands and copying my contacts in order to harass fellow employees,” she wrote. According to court documents, Barr did not admit to the allegations in the restraining order but agreed to the terms of the order. The court ordered Barr to return his ex-wife’s vehicle and work with a real estate broker to sell the house. Barr’s arrest in 2007 for alleged domestic assault was not his first brush with the law. According to a Hartford Courant article, Barr was arrested in 2000 at the age of 25 for disorderly conduct. His address was listed then as 1528 Stanley Street in New Britain, a house which, according to city records, he owned at the time. Barr was elected to AFSCME Council 4’s top position in 2018 in a last-minute election bid when AFSCME’s Director of Collective Bargaining Kevin Murphy was not allowed to run for the top seat. Although he was elected to a four-year term as head of AFSCME Council 4, the election results were challenged by Barr’s opponent, Charles “Chuck” Della Rocco, president of AFSCME Local 749. Della Rocco’s challenge was upheld by the U.S. Department of Labor and the union was ordered to hold another election this year. Before taking the helm of one of Connecticut’s most powerful public-sector unions, Barr worked for the Connecticut State University system for 20 years, most recently as a voice system analyst for Eastern Connecticut State University. Barr was president of the Connecticut State University Organization of Administrative Faculty and served briefly as Council 4 president before being elected executive director in 2018. Barr entered foreclosure mediation with Wells Fargo Bank in 2011 for the home he and his wife shared in Colchester. The matter was finally settled in 2016, according to court documents available online.